Note: The dates listed below are the approximations of historians and each source may vary a few thousand years. The earliest date of Japan's settlement is something that is told in legend. What is now a series of islands was once a land mass connected to the Eurasian continent (Murphy). Some believe that the country was settled as far back as 35,000-30,000 BC by indigenous Paleolithic people from the Asian mainland ("History of japan,"). With this era came its share of hardships, as the progressive increase in population size lead to scarcity in food and fauna (Murphy). This period lasted roughly up until the end of the Ice Age, in which the Jomon era began ("Ancient japan history,"). Lasting from around 11,000- 300 BC, the Jomon period saw an early increase in population size and the era brought with it the skills of crafting pottery as well as ceramics ("Jomon culture," 2002). Towards the end of this timespan, the populations contracted with the cooling climate and shortage of food ("Jomon culture," 2002). After this, from around 300 BC-300 AD, the Yayoi people displaced the Jomon and brought with them skills such as weaving, metal working and the cultivation process of rice- a crop that is still widely grown today ("History of japan,"). It was during this timespan, along with the rise of plant dependency, that social classes began to form and societal Japan began to take shape ("Early Japan," 2002). For more information on Japan's early settlement, specifically in the Paleolithic period, please visit this link. For a brief look at the Japan's settlement period, as well as the various eras the country has experienced, vist the link below. 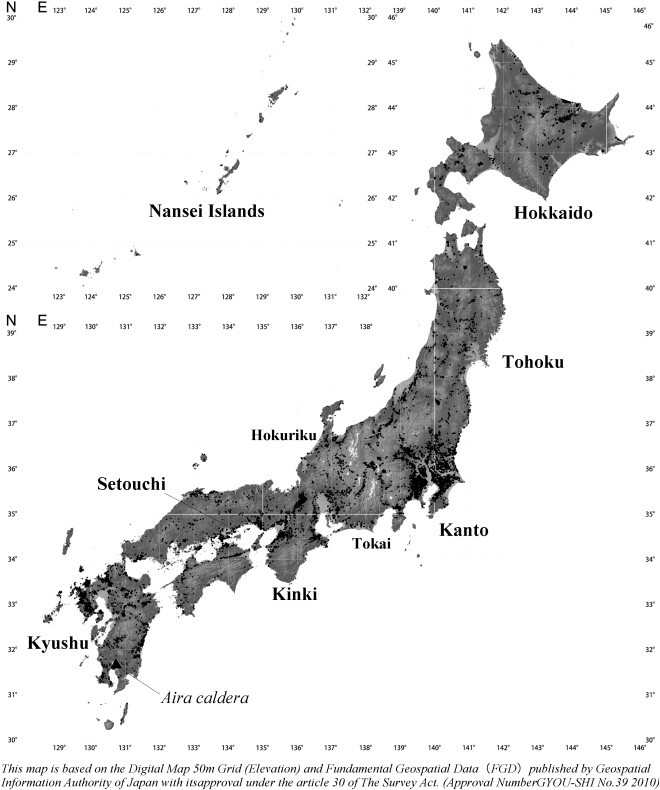 Japan's early settlement and eras. 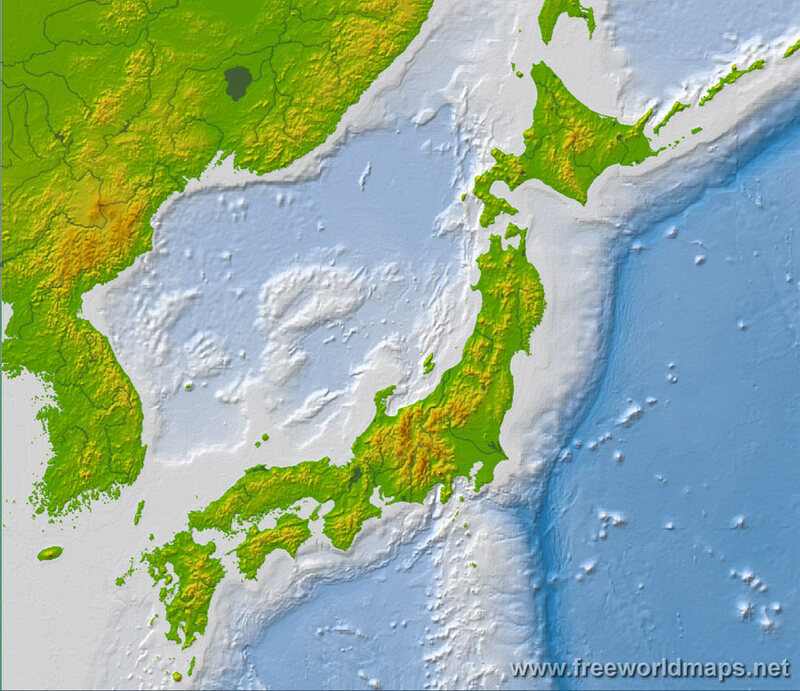 Follow the link below to find more information regarding Japan's Jomon period. Japan's early settlers faced a great deal of obstacles. As you'll see below, the country has a very unique climactic and geographic environment that would have put the settler's abilities to the test. Japan is unique in that agricultural practices were not widely used throughout the country until around the time of the Yayoi period ("The prehistoric archaeology,"). 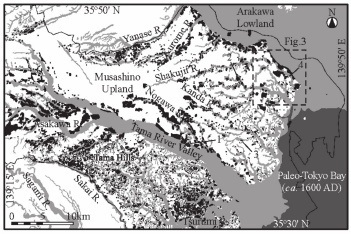 Existing as primarily hunters and gatherers, the Jomon resided in fishing communities during periods of time where the climate was warmer (Hirst). Shown below is an image near Tokyo Bay where fishing communities, indicated by the color black, are believed to have existed. Although there is some evidence that the Jomon did cultivate plants, dependence on plant life did not truly develop until the Yayoi brought over their practice of rice cultivation ("The prehistoric archaeology,"). Despite this, later settlers would find that they had no shortage of water for their cultivated plants. 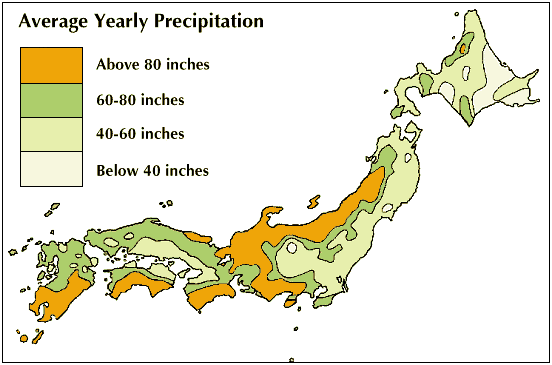 As the images below show, Japan is a fairly moist country with almost no dry season. This high level of precipitation would have been agriculturally beneficial for later settlers who were not dwelling in the uneven mountainous terrain. Japan has a relatively mountainous terrain that would have made frequent travel and farming difficult in large areas ("Natural resources of," 2012). In fact, because a significant portion of the country is uneven and laden in forests, only around 25% of the land is able to be farmed ("Natural resources of," 2012). 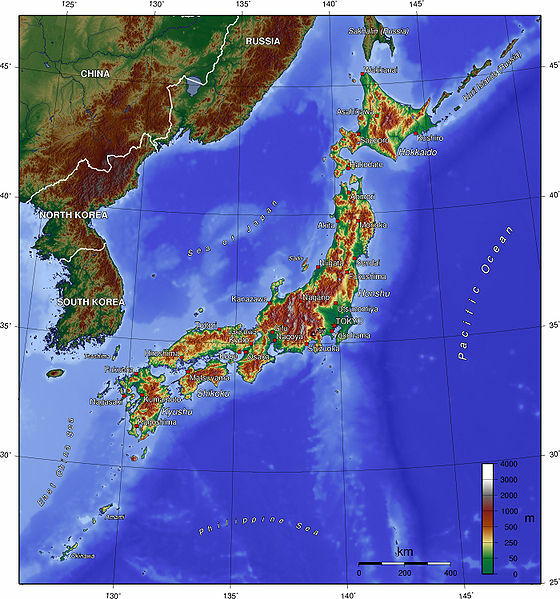 In the link below you will find more maps and information on the natural resources of Japan and the resulting challenges it faces. In summary of my findings, I found that many researchers believe that humans have resided in Japan for thousands of years. Although historians debate over the earliest point of settlement, most agree that people were inhabiting this area well before the last Ice Age. In terms of population, fluctuations occurred on several occasions due to a changing climate and shortage of food. From the Jomon era, to the Yayoi period, I found that this country has culturally evolved to great extents over centuries. Whether that be in terms of how the people gathered food, or the items they produced, Japanese settlers developed skills to survive. Finally, my research indicated that Japan is a country with its fair share of challenges. From its rocky terrain, to its moist climate, the Japanese settlers had to live and adapt to an environment that was uncompromising. Many believe that in the coming decades, Japan's population will steadily decline. Shown next is a projection of what the Australian government believes Japan's population will look like over the next fifty years. 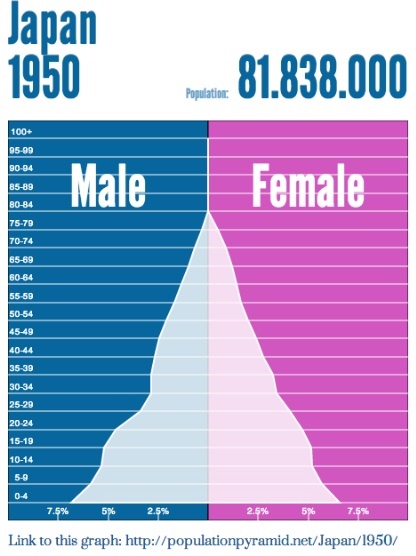 Japan's population has grown increasingly older over the last fifty years or so. As the image below will show, during the year 1950, much of the country's population was young and the older population's size began to taper off at around forty years old. This trend could possibly be explained due to a shorter life expectancy. One might believe that without the treatments of more modern medicine, much of the elderly population passed away before reaching the age of eighty. As you'll see in the link below, in sixty years, it would appear that much of Japan's population has aged and the percentage of young people has declined. Like the Australian chart above, the following image shows the different population percentages during the year 2010. 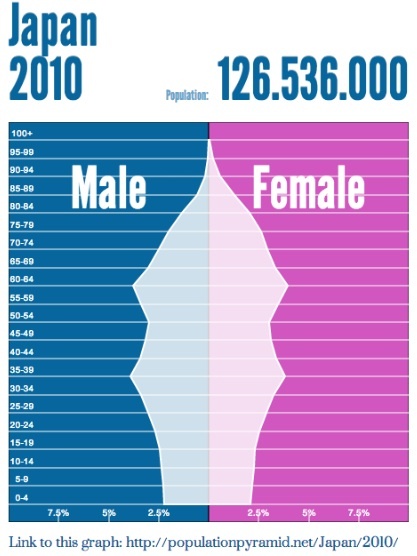 The pyramid for 2010 shows a large portion of the population hovering at around 35-39 age group, as well the 60-64 group. I would speculate that the chart differs from the one from 1950 because the young population has aged and is continuing to live longer lives. Because of this longer life expectancy, I believe more time and resources are being devoted to the care of the older population. Like someone maintaining an old car, Japan must continue to provide for the older population, instead of focusing solely on its youth. 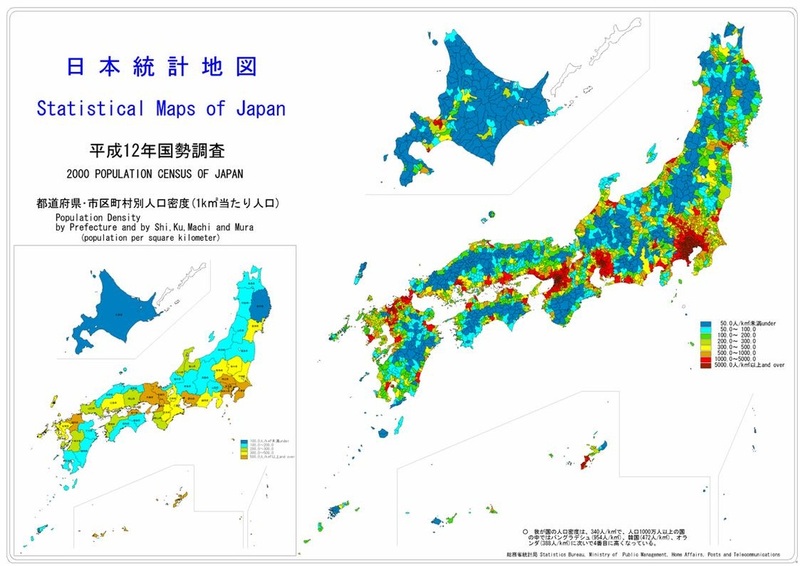 Further establishing this trend, a recent article noted that Japan logged a record-breaking drop in overall population. In addition, the article also says that seniors are expected to make up 40% of the population by the year 2060.